The race for the Norris Trophy seemed like a foregone conclusion at the midway point of the National Hockey League season. Calgary Flames defenseman Mark Giordano was the pick to walk away with the hardware for the best blueliner. However, a torn biceps injury to the Flames’ standout has opened up the race for the Norris and one of the candidates that should get serious consideration is the Nashville Predators’ Shea Weber. Weber is tied for fourth in the most goals by a defenseman with 15 (Tied with Dustin Byfuglien of the Winnipeg Jets and Erik Karlsson of the Ottawa Senators. ), and is thriving in new coach Peter Laviolette’s new system that allows the defense to play a larger role in the offense. Weber also in the top 20 in other offensive categories such as points (43, eighth), +/- (+16, tied for 10th with teammate Roman Jossi) and assists (28, tied for 17th) as of March 3. He’s also a major force on special teams as he’s got five extra-man markers. It’s probably got something to do with his really hard slap shot that was clocked at 108.5 miles per hour at the All-Star Skills Competition in Columbus last month. Weber is also an important factor on the Preds’ penalty kill, as he’s one of the best shots on the PK that is 12th in the National Hockey League with an 82.1-percent efficiency rating. Weber puts up a lot of points, but he’s not the stereotypical offensive-defenseman that might shy away from contact. Weber is a big body that isn’t afraid to get dirty as he’s got 66 penalty minutes and averages 4.81 hits per 60 minutes or 2.13 per game. The Predator captain has many fans, but none bigger than General Manager Dave Poile. He told Kevin Allen of USA Today Sports about Weber’s all-around game. The organization feels that Weber should’ve have already won the Norris at least once or twice before because of his effect on all phases of the game, and this was under former coach Barry Trotz’s defense-first system. Weber has been nominated for the top defenseman trophy three times, but has come up empty. Weber isn’t the only defenseman that is shining this season. Pittsburgh Penguins blueliner Kris Letang has bounced back from a stroke to leading all defenseman in points with 10 goals and 39 assists for a total of 49. Letang is a +12 and has made strides in his defensive game and his enhanced stats. St. Louis Blues defenseman Kevin Shattenkirk would’ve be in the mix, but he had to undergo abdominal surgery. Shattenkirk collected eight goals and 32 assists for 40 points before he went on injured reserve. The main draw card for Weber getting the award is the turnaround for the Predators. Nashville finished 10th in the Western Conference and missed the playoffs in the 2013-14 season. Weber has always been a good player, but it’s hard to get noticed on a team that doesn’t win. However, Nashville is taking care of that problem this season despite some recent hiccups in this four-game losing streak. The years the Predators won playoff series in 2011 and 2012 were the years that Weber was runner-up for the Norris. If Nashville can right the ship, they will be in a good position to win another playoff series and thus solidifying Weber’s résumé. Weber has also grown into the rule of being the face of the franchise. Weber is a quiet, hard-working man that shows up and does his job. Poile explained in the same USA Today piece referenced earlier. Weber is also making the rest of the defense better. Look at how Roman Josi is enjoying life as Weber’s defense partner, as he has 11 goals and 35 assists for 46 points as of March 4. Josi and Weber seem to be on the same wavelength and make up arguably one of the best D-corps in the league. 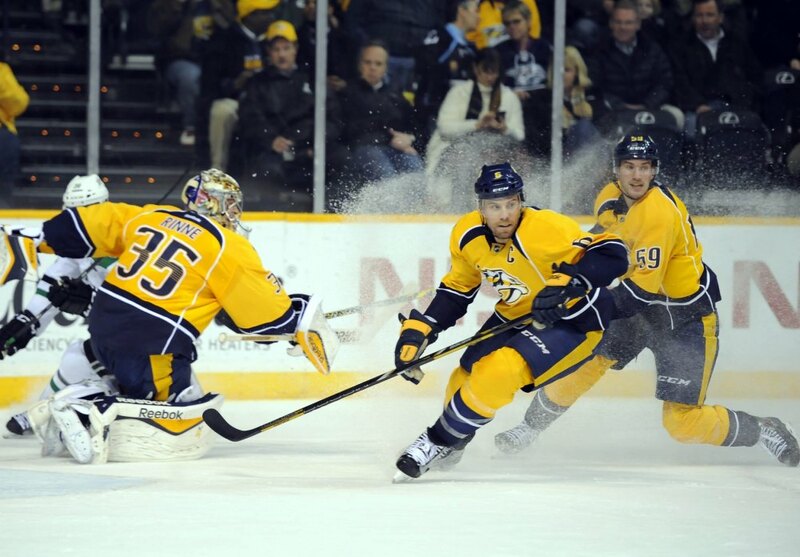 Weber has also played a hand in the maturation of Seth Jones, who has six goals and 16 assists. Jones is an exceptional athlete and is starting to mirror the captain in his play. When all is said and done, Shea Weber should finally get the Norris Trophy that he’s been seeking. Dan Mount covers the Nashville Predators for The Hockey Writers. He can be found on Twitter @DanMountSports.